The ADaM inventory system allows for multiple warehouses. Each warehouse can have multiple bin locations. 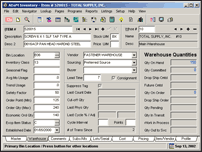 Usage rates and inventory management information is calculated for each warehouse. Primary Vendor and Sourcing information provides intelligent info for easier decision making. 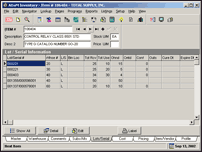 Physical inventory and cycle counting information is available at a glance. 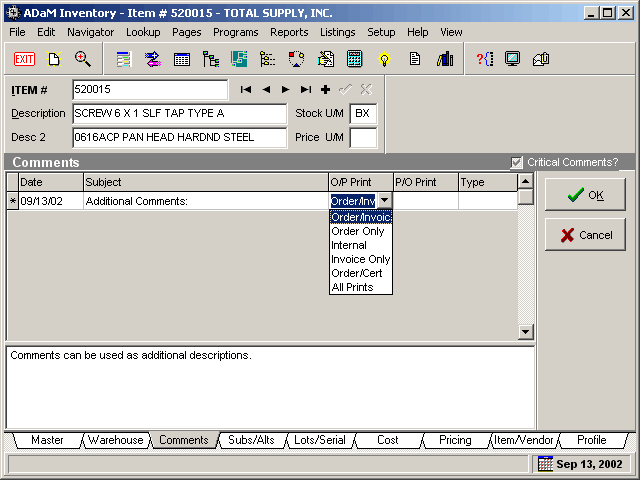 Inventory comments provide a unique opportunity to automatically 'attach' item specific comments to pick tickets, sales orders, quotations or invoices. Internal dated comments are useful as well, to provide general comments about each inventory item. Standard or 'Canned' comments can be created in advance and used to easily create lengthy comments quickly. 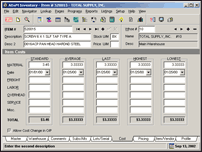 Inventory comments can be used for unlimited length descriptive information that can print on invoices. Every item in the ADaM inventory system can be cross referenced with substitute or alternate item numbers. Associated items can be attached to an item allowing for additional 'up-selling'. Interchangeable item numbers can be used to cross reference industry standard part numbers such as bearings. 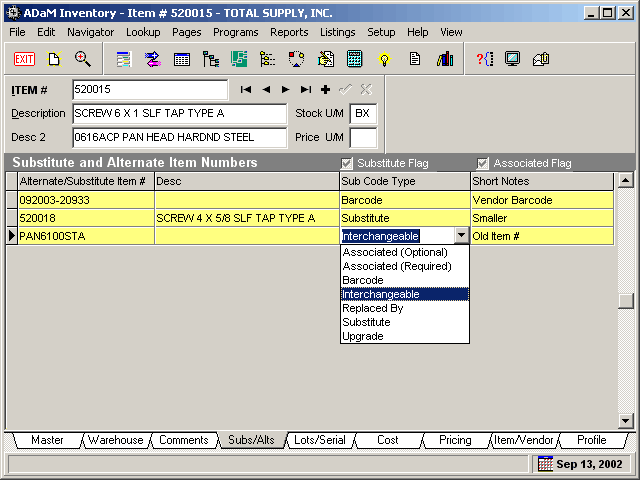 Bar-code cross referencing allows for scanning vendor labels and translating to your item number. 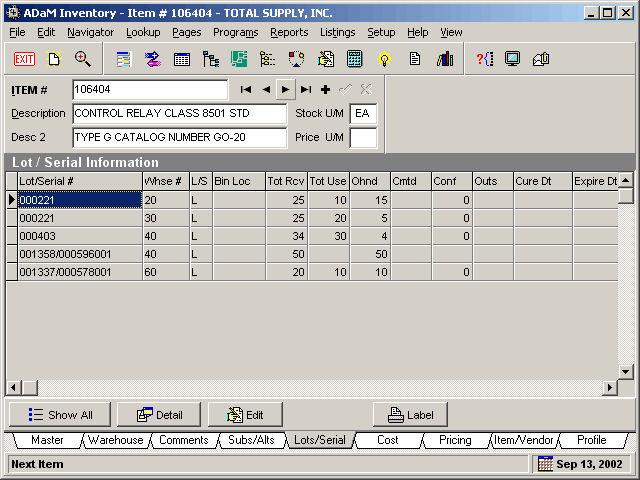 The ADaM inventory provides an option for lot and/or serial controlled items with full traceability. 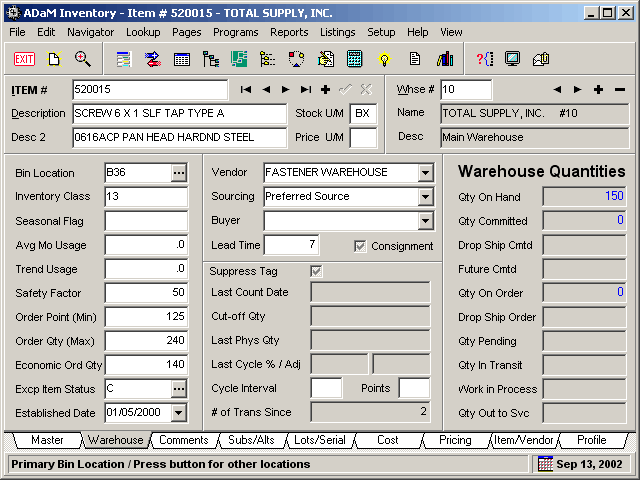 Inventory controlled items by lot or serial keep detailed transactional history for every item. And with detail inquiries, information is quickly available for full traceability, who the item was bought from, sold to, even sent out for service. 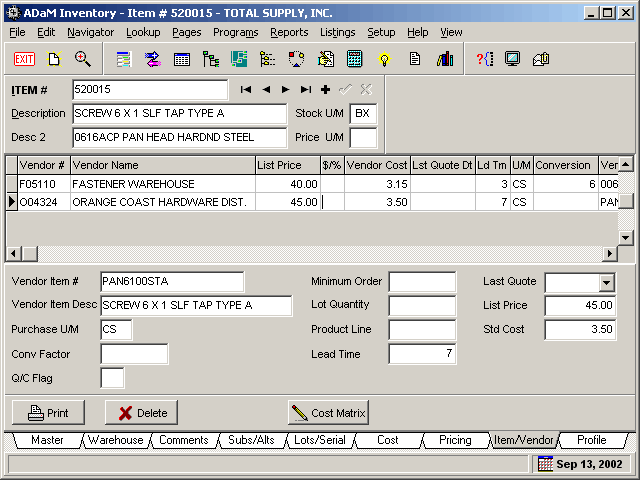 The ADaM inventory provides multiple methods for managing each item's cost. 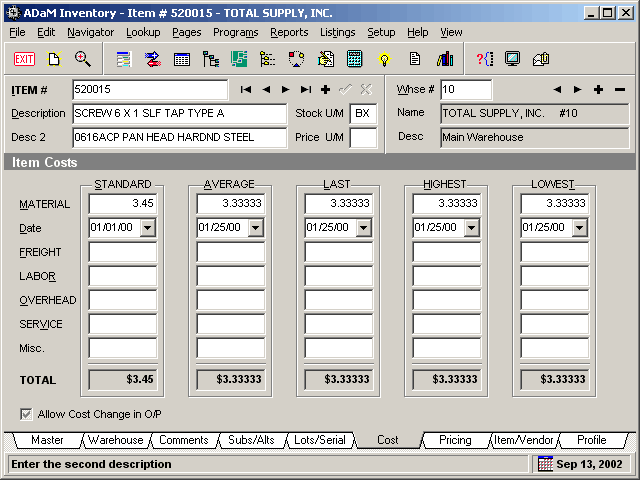 You can value inventory by Standard cost, Weighted average, Last or FIFO. The item cost display page breaks each item cost down by material cost, labor, freight, outside service and others. Cost changes are dated so that you can see when cost change for easy traceability. The highest and lowest cost paid provides additional analysis information. Pricing and pricing controls are easy to implement with ADaM. 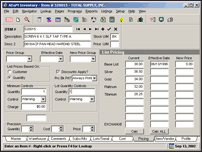 Pricing of items can be done using a variety of different methods. 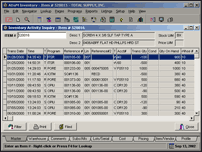 Price groups allow for categorizing items into different price structures. Minimum and Incremental lot controls allow your sales people to optimize order lines for streamlined processing and profit controls. When you have the opportunity to purchase items from different vendors, the ADaM Inventory system can help with multiple vendor information for each item. So information like the vendor's item number, lead time and list price is available during the purchase process. 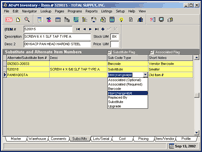 The item profile provides additional information and properties of an inventory item. 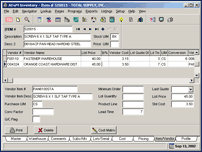 With user defined specifications, every item or inventory type can have specifications that can be used to narrow item searches. For example, specifications can be set up such as color, length, material, grade, diameter or any other that you can think of. Every transaction that affects your inventory is recorded. Each transaction record is date/time stamped and referenced by document, customer or vendor, warehouse and the transaction type. 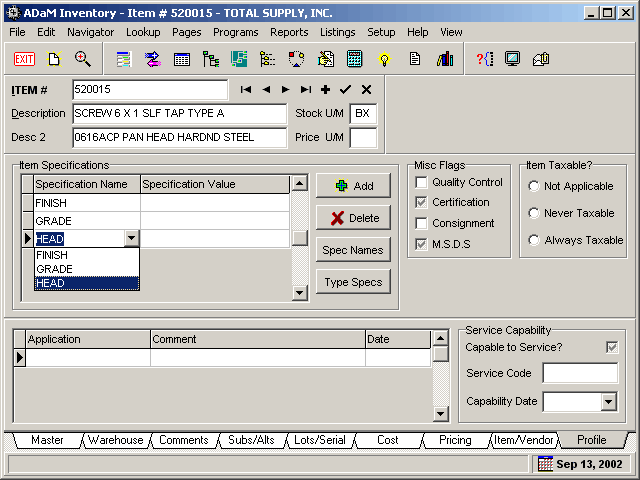 A 'snapshot' is taken of the inventory quantity on hand to show the state of the inventory after the transaction. 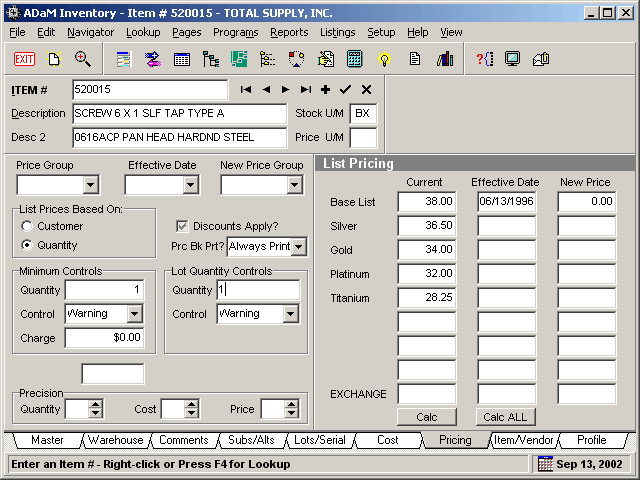 The inventory activity inquiry is a great tool for analyzing the effects of transactions on the inventory. 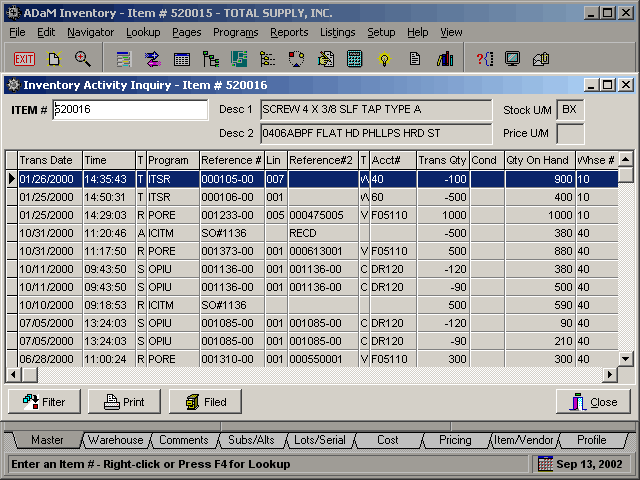 Inventory activity is also available via different transaction reports. 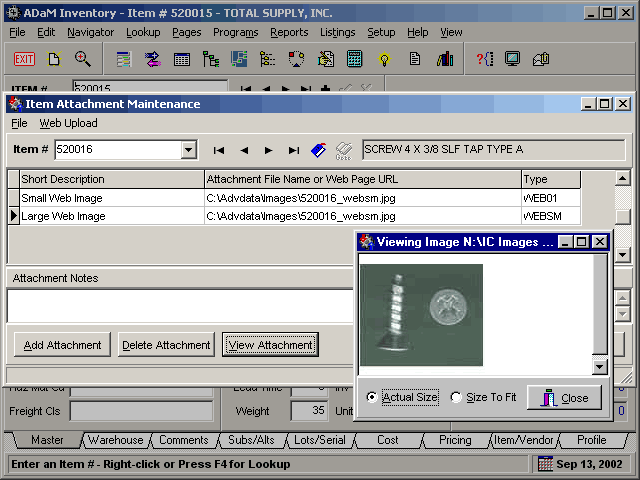 The inventory item attachments system allows you to 'attach' any document or image to an inventory item. 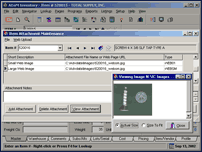 The document or image display is available with a simple double-click. The attachments are also available during the sales order process, so that while you are placing an order, an image or document can be displayed 'on the fly'. 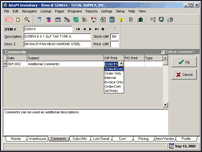 Some examples of documents include .doc, .PDF, and .txt files. Any type of image including .bmp, .jpg and you can even 'attach' a web address to the manufacturer's product page. Inventory Item attachments are also used with the ADaM On-Line e-commerce catalog to identify and post images to your web site. 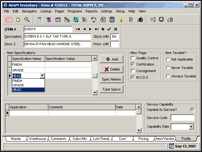 The ADaM Inventory system provides a fully integrated bill of materials system. 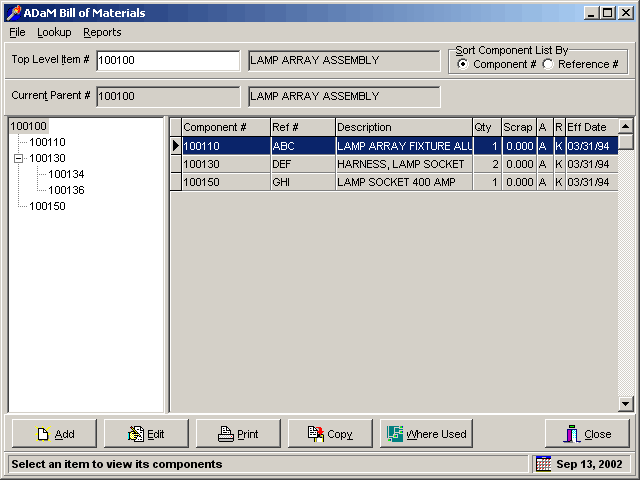 The bill of materials is useful for setting up 'kits' that can be used during the order process. The bill of materials is also used with the ADaM production system for creating assemblies and finished goods. 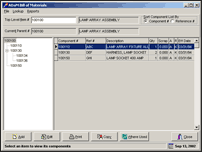 The ADaM bill of materials allows an indented bill of material so that an item can be comprised of other items that also have a bill of material. The 'structure' of the bill of material is viewable with a 'tree view' display.